Stanley & Katrina have taken up the hobby of writing. Katrina von Cat the Master of Wisdom and Knowledge is an eight-year-old grey tabby cat who loves her toy mouse. They would love to tell you where they live but all they know is that they live in a tan house. 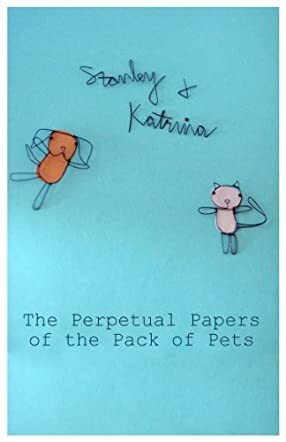 The Perpetual Papers of the Pack of Pets (Stanley & Katrina) is the story of a love-hate relationship between Katrina, the cat, and Stanley, the dog. Both of them are different personalities and they live under the same roof. They have been living there for three years and they finally decide to communicate with each other. The book is really humorous. It is unique in a manner where you see the cat and dog communicating with each other about themselves, their likes, and dislikes in a letter form. The narrator's tidbits add to the charm of the book. The contrasting characters and their individual personalities have been etched well. The author has put the perspective of the pets in the forefront and written a unique and excellent book for children. Mandy, the bird, is another animal character that shares the space in the story along with Katrina and Stanley. Children always have an immense liking for animals and pets and they will find this story delightful and funny. A dog and a cat writing letters to each other? That is the highlight of the book. The author has stepped out of the usual comfort zone and written something different for children. This book makes all readers look at pets with a different perspective. It shows us an angle to animals which we never thought possible. Will Stanley and Katrina win the Pet Show with their lovable antics?